The ‘spectral variation hypothesis (SVH)’ assumes spectral variability as a result of variation in species richness. In the present study, we explore the potential of satellite datasets in identifying the patterns in species richness in part of three global biodiversity hotspots falling in India viz., Himalaya, Indo-Burma, and Western Ghats. We used generalized linear models to correlate remote sensing based vegetation indices (VIs) and physiographic indices (PIs) with plant richness calculated using 1264, 1114, and 1004 field plots across 21 different forest vegetation classes in Himalaya, Indo-Burma, and Western Ghats respectively. Three different vegetation indices ranked highest in explaining the variance in plant richness in the three hotspots. 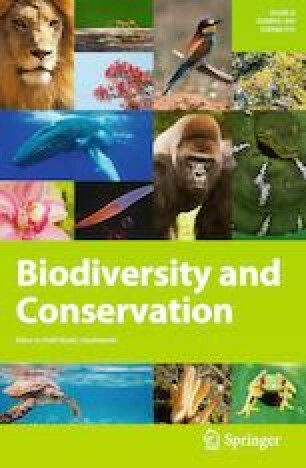 The variance in species richness explained by models based on only VIs was highest (69%, P < 0.01) for Bamboo vegetation in Indo Burma hotspot with Normalized Difference Vegetation Index, followed by that for dry deciduous forest in Western Ghats (57%, P < 0.001) with Normalized Difference Water Index, and for grasslands (54%, P < 0.05) in Himalaya by Modified Soil Adjusted Vegetation Index. The explained variance increased with combined models that are based on PIs and VIs to up to 85% (P < 0.05). Overall, we observed very high correlation between VIs and plant richness in open canopy vegetation classes with low species richness such as grasslands, scrubs, and dry deciduous forests, followed by vegetation classes with moderately dense canopy. Our study provides crucial insights on utility of satellite datasets as a proxy for estimating plant richness for better conservation of diverse ecosystems. Communicated by M.D. Behera, S.K. Behera and S. Sharma. The online version of this article ( https://doi.org/10.1007/s10531-019-01761-4) contains supplementary material, which is available to authorized users. The authors are thankful to Dr. PS Roy, Project Director, Biodiversity Characterization project for providing the field sampling data for this study. The views and interpretations in this publication are those of the authors and are not necessarily attributable to ICIMOD.